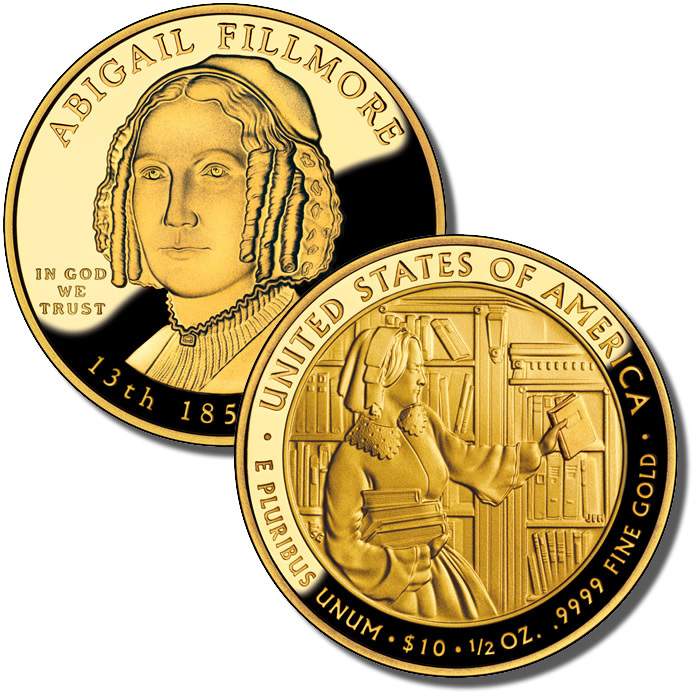 The 2010-W $10 Abigail Fillmore First Spouse Gold Proof Coin marks the fourteenth proof coin of the First Spouse series to be issued by the United States Mint. Authorized by the Presidential Coin Act of 2005 along with circulating dollar coins honoring the former Presidents of the United States, these coins are designed to honor the spouses of those presidents. As such, the Spouse Gold Coins are released on approximately the same schedule as the President Coins of which they are affiliated with. The obverse of each Spouse Coin shows a portrait of the honored individual. The reverses show designs that are emblematic of that individuals life and work. When a former President served without a spouse, a design reminiscent of the mythical figure Liberty is used. If more than one spouse is affiliated with the president, both will be shown on separate coins. Featuring a face value of $10, the coins are actually worth much more as they contain one half ounce of .9999 fine gold. 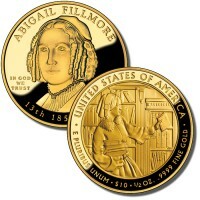 The Abigail Fillmore First Spouse Gold Coin was released on March 18, 2010. When first released, the Abigail Fillmore Proof Coins sold for $729. However, these prices can be adjusted weekly and are based on the Mint’s precious metal coin pricing matrix which ties the price of these coins to the average of the previous weekly London Fix. Each of these coins were struck at the US Mint’s facility in West Point and thus have the "W" mintmark on their obverse. United States Mint Sculptor-Engraver Phebe Hemphill designed and sculpted the portrait of Abigail Fillmore which is found on the coin’s obverse. The reverse image of Abigail shelving books in the White House Library (which she helped create) was designed by Artistic Infusion Program Master Designer Susan Gamble and sculpted by Joseph Menna.